happy Mother's Day! i called mine, have you called yours yet? 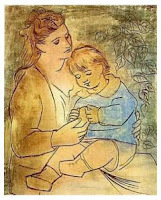 this pic is from Picasso, Mother and Child. that's all i got. however, i did give a special blessing for mother's today at mass. this weekend was busy - with a youth retreat for our LifeTeen! after leaving Waupoos Farm, where things were happenin', i was listening to my new XMRadio, channel 90's on 9! good times. i heard Praise You by Fatboy Slim, and it was fitting since we had just finished celebrating mass! no matter the hard times or good, the family of God lifts up my heart so that i can praise Him! i was happy to help with their retreat, theme: joyful noise. the first thing that came to mind when i heard about the theme, was Flavor Flav, "yeah boy"! indeed, i remembered Public Ennemy + Anthrax's duet, Bring the Noise (1987). sounds funny when using the word 'duet' while speaking of heavy metal bands. anywho, this is not my favourite genre, however, God's light works through everything. the theme, joyful noise, hence ... bring the noise, was based on the psalms. it was a good weekend. i also enjoyed the videos the youth did to popular songs. maybe i'll get to do one someday. back to my xmradio fad. i've listened to local radio for far too long. i'm tired of all the stupidity sometimes - for example, Hot89.9's contest married in 23hours! come on?! enough, already. so, using a gift card i received at Christmas, i bought a kit to install xmradio in my car. i set it up last week, and groovy, it works! i've now got over 100+ channels of music, talk and sports. i've listened to eight channels so far. like McDo's, i'm lovin' it! i've also noticed the same experience that i had when i first signed up for my facebook account. after signing up, i was back in contact with people i hadn't heard from in over 5, 10, even 20years. can you believe it? similarly, after listening to xmradio i've heard songs that i forgotten i knew, and loved! yeah boy! anywho, maybe that will help me post more frequently, eh? there's a strong chance of it. also, at the parish, we are preparing to go live with a new website. hopefully that will come out soon. finally, this is pro-life week. it'll be busy. my dad's coming in to surprise me with a two day visit, vocation's meeting tomorrow night, finalizing Montée Jeunesse details, March for Life on Thursday, ordination of our brother Hezuk to the transitional diaconate on Friday, more Montée Jeunesse activities next Saturday including a few baptisms, and first Holy Communions! yeah boy! if my knee hangs in there (indeed, hopefully it does not fall off), i may play a little street hockey - just a bit, no worries. enjoy the week, enjoy Life! peace out.